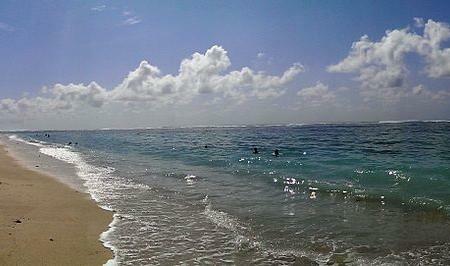 Also known as the ‘Pantai Pandawa’, Pandawa Beach stretches across the south of Bali, on the Bulkit Peninsula. This popular beach in Nusa Dua is a must visit for an activity filled day, and lot of beautiful natural and man-made attraction. The beach is hidden behind tall limestone cliffs that surround the area, which also provide the best backdrop for award-worthy pictures! The panoramic views of the deep blue Indian Ocean, clear skies, man-made limestone statues peppered along the beach, the white sandy beach and just the incredible amalgamation of all these elements together, is straight out of picture books. This popular beach in Nusa Dua is a must visit. Wonderful view at Pandawa Beach. The color of the water tend from blue to green with clear white of the waves. You can ride motorcycle to go there, the parking price is about 3k. You can use drone here for free. There are a lot of food stalls there, I recommend to eat seafood, it’s delicious and quite cheap. There are also gazebo to rest and enjoy the beach. This is not really the prettiest beach out there in Bali. Good if you want to have a swim or just walk around or if you’re comfortable with the crowd (since it’s really crowded). The religious statues are breathtaking though and that’s really what Bali is all about, culture. If you want better looking beaches/shorelines, you might as well head to the Nusa Dua Luxury Beach, take a ferry to the neighboring islands, or better yet, ask your driver if he could take you to a spot not known by most tourists. Beach is like any other. But very crowded. And nothing is for free. Even the chairs on the beach are for rent. You don't have a place to seat without paying. The entrance to the beach is beautiful and clean. But nothing else to see. No water sports except kayaking. So if it's in your package you can visit. Else specially going there isn't worth. You may miss out on something better. Clean beach, clear water, white sand, and children friendly. Visit it in weekday is more enjoyable than in the weekend. Also nice for lazy time just by laying on the sand or in the rented tent of its edge. Dont ever forgot to bring to bring your glasses and sunblock. Be ready to be tanned. Love it.